Binder Labels are printed with a special removable adhesive that peels off clean with no sticky residue. Adhesive sticks to ring binders, metal charts and plastic charts. Binder Labels are printed using a smudge proof label stock that can be easily written on. 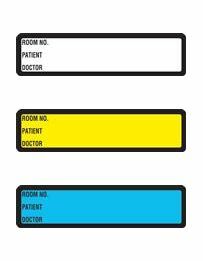 Pre-Printed Binder labels are used to quickly and easily identify charts by room number, patient or doctor name. 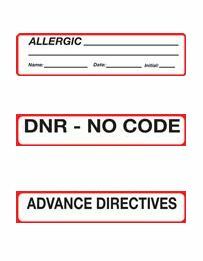 Binder Labels are also used for color coding ring binders and alerting staff & doctors to patient allergies and conditions. 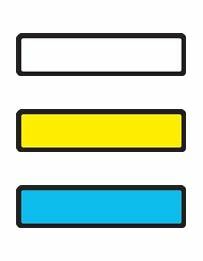 Label Size 1-3/8"H x 5-3/8"W - 200 per Roll. Size: 5-3/8 W x 1-3/8 H, Packed 200 Labels per Self-Dispensing Box, SIDA.. Size: 5-3/8 W x 1-3/8 H, Packed 200 Labels per Self-Dispensing Box, SIDN.. Size: 5-3/8 W x 1-3/8 H, Packed 200 Labels per Self-Dispensing Box, SIDD.. Size: 5-3/8 W x 1-3/8 H, Packed 200 Labels per Self-Dispensing Box, SIDI..
BLANK GOLD RING BINDER LABELS 1-3/8H X 5-3/8W - 200/ROLL..
BLANK ORANGE RING BINDER LABELS 1-3/8H X 5-3/8W - 200/ROLL..
BLANK TAN RING BINDER LABELS 1-3/8H X 5-3/8W - 200/ROLL..
BLANK PEACH RING BINDER LABELS 1-3/8H X 5-3/8W - 200/ROLL..
BLANK SALMON RING BINDER LABELS 1-3/8H X 5-3/8W - 200/ROLL..
BLANK RED RING BINDER LABELS 1-3/8H X 5-3/8W - 200/ROLL..
BLANK PINK RING BINDER LABELS 1-3/8H X 5-3/8W - 200/ROLL..
BLANK ROSE RING BINDER LABELS 1-3/8H X 5-3/8W - 200/ROLL..
BLANK LAVENDER RING BINDER LABELS 1-3/8H X 5-3/8W - 200/ROLL..
BLANK LT.BLUE RING BINDER LABELS 1-3/8H X 5-3/8W - 200/ROLL..
BLANK BLUE RING BINDER LABELS 1-3/8H X 5-3/8W - 200/ROLL..
BLANK AQUA RING BINDER LABELS 1-3/8H X 5-3/8W - 200/ROLL..
BLANK TURQUOISE RING BINDER LABELS 1-3/8H X 5-3/8W - 200/ROLL..
BLANK MINT GREEN RING BINDER LABELS 1-3/8H X 5-3/8W - 200/ROLL..
BLANK LIME GREEN. RING BINDER LABELS 1-3/8H X 5-3/8W - 200/ROLL..
BLANK CHARTREUSE RING BINDER LABELS 1-3/8H X 5-3/8W - 200/ROLL..
BLANK GRAY RING BINDER LABELS 1-3/8H X 5-3/8W - 200/ROLL..
BLANK BROWN RING BINDER LABELS 1-3/8H X 5-3/8W - 200/ROLL..
BLANK PURPLE RING BINDER LABELS 1-3/8H X 5-3/8W - 200/ROLL..
BLANK GREEN RING BINDER LABELS 1-3/8H X 5-3/8W - 200/ROLL..
BLANK WHITE RING BINDER LABELS 1-3/8H X 5-3/8W - 200/ROLL..
BLANK YELLOW RING BINDER LABELS 1-3/8H X 5-3/8W - 200/ROLL..
PREPRINTED GOLD RING BINDER LABELS 1-3/8H X 5-3/8W - 200/ROLL..
PREPRINTED ORANGE RING BINDER LABELS 1-3/8H X 5-3/8W - 200/ROLL..
PREPRINTED TAN RING BINDER LABELS 1-3/8H X 5-3/8W - 200/ROLL..
PREPRINTED PEACH RING BINDER LABELS 1-3/8H X 5-3/8W - 200/ROLL..
PREPRINTED SALMON RING BINDER LABELS 1-3/8H X 5-3/8W - 200/ROLL..
PREPRINTED RED RING BINDER LABELS 1-3/8H X 5-3/8W - 200/ROLL..
PREPRINTED PINK RING BINDER LABELS 1-3/8H X 5-3/8W - 200/ROLL..
PREPRINTED ROSE RING BINDER LABELS 1-3/8H X 5-3/8W - 200/ROLL..
PREPRINTED LAVENDER RING BINDER LABELS 1-3/8H X 5-3/8W - 200/ROLL..
PREPRINTED LT BLUE RING BINDER LABELS 1-3/8H X 5-3/8W - 200/ROLL..
PREPRINTED BLUE RING BINDER LABELS 1-3/8H X 5-3/8W - 200/ROLL..
PREPRINTED AQUA RING BINDER LABELS 1-3/8H X 5-3/8W - 200/ROLL..
PREPRINTED TURQUOISE RING BINDER LABELS 1-3/8H X 5-3/8W - 200/ROLL..
PREPRINTED MINT GREEN RING BINDER LABELS 1-3/8H X 5-3/8W - 200/ROLL..
PREPRINTED LIME GREEN. RING BINDER LABELS 1-3/8H X 5-3/8W - 200/ROLL..
PREPRINTED CHARTREUSE RING BINDER LABELS 1-3/8H X 5-3/8W - 200/ROLL..
PREPRINTED GRAY RING BINDER LABELS 1-3/8H X 5-3/8W - 200/ROLL..
PREPRINTED BROWN RING BINDER LABELS 1-3/8H X 5-3/8W - 200/ROLL..
PREPRINTED PURPLE RING BINDER LABELS 1-3/8H X 5-3/8W - 200/ROLL..
PREPRINTED GREEN RING BINDER LABELS 1-3/8H X 5-3/8W - 200/ROLL..
PREPRINTED WHITE RING BINDER LABELS 1-3/8H X 5-3/8W - 200/ROLL..
PREPRINTED YELLOW RING BINDER LABELS 1-3/8H X 5-3/8W - 200/ROLL..